The organ at Church of the Resurrection is a tracker organ, meaning each key is connected directly by a thin flexible wooden strip called a tracker. When a key is struck the tracker activates the air valve under the corresponding pipe, to sound the pipe. There is no pneumatic or electrical assistance to the keyboard action. Tracker organs which respond directly and sensitively to the touch of the organist are noted for their clean, crisp sound. (For more information about the organ see below). Because of their initial cost tracker organs are still the minority of church organs being made today; however, cost of upkeep and life expectancy far surpass that of every other kind of organ. Hundreds of tracker organs in Europe are still in use, some of them over 300 years old. J.S. Bach played a tracker organ. * Briefly: two manual keyboards, each for 56 notes; pedal keyboard for 30 notes; 16 ranks to make 12 registers forming 14 stops. Sound is based on older classic northern European organs. * Case (or cabinet) is fumed white oak. 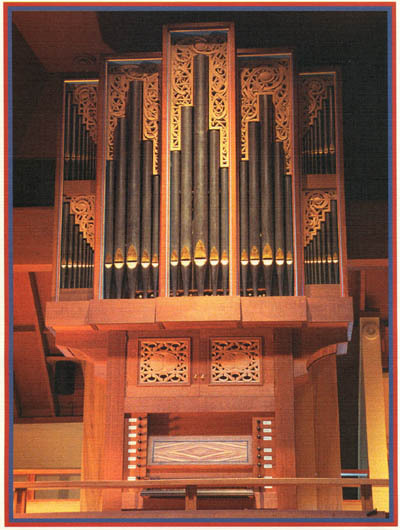 Arrangement of pipes is a modern look but based on an organ of Italian Renaissance design the Brombaugh shop made for the chapel at Duke University. The moldings of each of the top five sections housing pipes are marked (not clearly visible in the photograph) with light blue, soft red and gilding. * Pipeshades (spandrels) are carved of white oak. * Most trackers are Alaska yellow cedar. * Adjustable doors cover the Brustwerk. * Tuning: cone tuning for small flue pipes; soldered hats for stopped metal pipes; reeds tunable by organist. * Wind system composed of wedge bellows operated by electric blower. * Keys: naturals are capped with cow shinbone; sharps are ebony. * Pedals: naturals are maple; sharps are Brazilian rosewood. * On keyboard case end block is zebra wood; key slip is ebony. * Diamond design on music rack is zebra wood, oak and ebony. For more information see description and disposition below; also see comments from musicians about the organ. Although the congregation had often talked about replacing a temperamental 1897 Estey reed organ which provided music for services, it was not until Betty Jean Bartholomew accepted a call to become music director and organist in 1996 that wishful thinking began to be converted into reality. Her vision was shared by the Rev. Jonathan Weldon, Vicar, who encouraged the congregation to go forward with the project. An Organ Committee under the leadership of Betty Jean Bartholomew was formed in 1997. The congregation responded generously to an initial pledge drive. Additional donations were also received from community members and persons from out-of-state. The Organ Committee sponsored a series of fund-raising events to raise the remainder of needed funds. Eventually enough funds were in hand or promised making it possible for the congregation to go forward by signing a contract on April 19, 1999, with John Brombaugh & Associates for delivery of an instrument in 2004. While the organ was being crafted the church was being prepared for its arrival. A large dormer was constructed in the front roof to provide room for the longest pipes. Inside, alterations were made to the balcony to provide risers for the choir. The acoustics were improved by removing all the carpeting in the nave and replacing the baffle design of the underside of the balcony by a hard, surface; also a large panel over the organ was erected to reflect its sound out into the nave. Delivery, installation, and tuning took place summer and fall, 2004 with Bishop Johncy Itty dedicating the organ at an Evensong, Nov.14, 2004. The inaugural year featured several recitals: a dedicatory recital by David Dahl (December 5, 2004); a duo recital by Julia Brown and Barbara Baird (March 6, 2005); a concert by Liuwe Tamminga and Marc Vanscheeuwijck, cellist,(May 8, 2005). Recitals continue to be given by visiting artists. Contact Church of the Resurrection for dates. This instrument has a twin (Op.38b) in the Florence Henry Memorial Chapel used by St. Dunstan’s Church of the Highlands, Shoreline, WA. Op. 38a and Op. 39b are the final productions of the Brombaugh workshop. 4. John Brombaugh and tracker organs. Background: With the advances in the uses of electricity in the 19th century, organs began to change as organ makers devised ways to apply electro-pneumatic principles to the construction of organs. Organs continued to evolve, turning eventually into something that no longer resembled the instruments for which the vast repertoire of organ music had been written. It became evident to some musicians as well as organ builders that something had been lost. Older organ music did not sound “right” on many of the newer organs. A reaction set in. The organ reform movement which began in Europe was slowly taken up in the United States in the 1930’s. A few American organs built before WWII showed the influence of the older classic designs, but for the most part they still had electric powered action. After WWII interest in mechanically operated (tracker) organs increased, but there was still much to be learned. Organ builders analyzed and experimented (and continue to do so today) to discover why older organs have such a unique sound. Lost techniques were slowly recovered. Today for the most part builders of tracker organs are not interested in making exact historical reproductions but rather historically inspired organs having appropriate artistic integrity. John Brombaugh played an important role in what is regarded as the second generation of tracker organ builders in the United States. His contributions to organ design is mentioned in several books: The Tracker Organ Revival in America, (Uwe Pape, 1974),The History of the Organ in the United States, (Orpha Ochse, 1975), All the Stops: the Glorious Pipe Organ and Its American Masters, (Craig R. Whitney,2003). The Brombaugh tradition is being carried on by the many apprentices who have served in his workshop; at least twelve have opened their own shops, many are working for other organ makers. A native of Ohio, John Brombaugh studied electrical engineering at the University of Cincinnati. After college he worked for Baldwin Piano and Organ Company, a manufacturer of electric organs. Intending to pursue a career in this field, he did graduate work in electrical engineering and acoustics at Cornell University. However his career took a different turn when he began listening to recordings of E. Power Biggs, Carl Weinrich, and Helmut Walcha playing tracker organs. Much taken with the sound of these older instruments John decided to become a builder of tracker action organs—–wholly mechanical organs which utilize organ construction techniques developed in the Middle Ages and perfected in the Baroque. At age 27 he apprenticed himself to Boston area organ builders Fritz Noack and Charles Fisk for three years. In 1967 he went to Germany to learn reed pipe making from Rudolf von Beckerath. Returning to the USA in 1968 he established his own firm in Germantown, Ohio. John moved his shop to Eugene, Oregon, in 1977. A Ford Foundation sponsored grant the summer of 1971 enabled John Brombaugh to study European organs. This trip and subsequent trips abroad have been the inspiration for organs produced by his workshop. Brombaugh organs are noted for their emulation of the visual, mechanical and tonal qualities of Europe’s finest historic organs, especially those of northern Europe. There are Brombaugh organs in twenty-three states, Sweden, Canada, and Japan. In Eugene Central Lutheran Church has a much larger (3 manual, 64 ranks, 38 stops) organ which was installed in 1976 and the Hult Center has a positiv organ (one manual portable). John Brombaugh is recognized internationally as one of the world’s most distinguished organ builders. The governor of Oregon bestowed on him the Governor’s Award for the Arts in 1996. He has a biographical entry in The New Grove Dictionary of American Music where he is also mentioned in five of their articles on organ building. 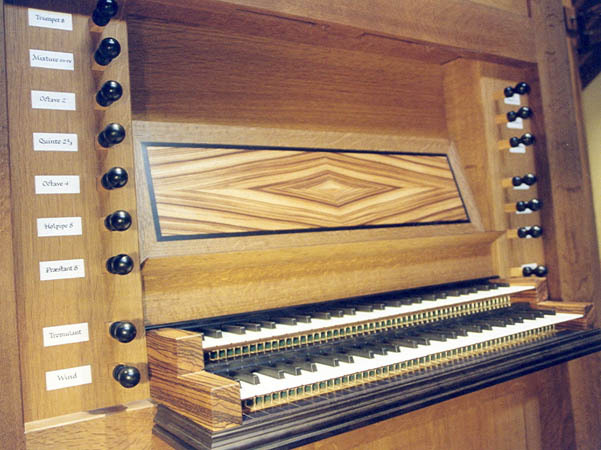 In 2006 Brombaugh was one of the organ builders honored in a symposium on “American Organ Builders of the 20th Century” at the Eastman School of Music, Rochester, New York. The Brombaugh shop is closed. In retirement John continues to act as a a consultant, mostly in Europe, on the restoration of historic organs.